The Bald Eagle is again a common site along the rivers and lakes of the Greater Yellowstone Region, and they always bring a thrill to Yellowstone visitors when they set their eyes on one of these magnificent birds. The thrill of seeing our national bird soar above never fails to awe a spectator. The bald eagle holds a position in the pecking order that parallels that of the grizzly. Of all the birds in the park, visitors are most interested in spotting this photogenic species. 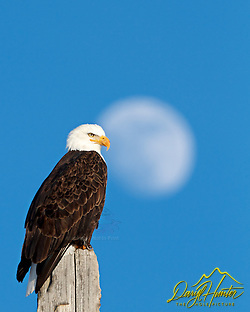 The Yellowstone/Grand Teton area is now home to one of largest populations of eagles in the continental United States They can be found along the lakes and rivers of Yellowstone where they perch in trees watching for fish. The Yellowstone Plateau, Snake River, Yellowstone Lake, and headwaters of the Madison River are prime spotting areas for this spectacular bird. The Bald Eagle was declared the National Emblem of the United States by the Second Continental Congress in 1782. It was selected by the founding fathers because it is a species unique to North America. Ben Franklin wanted the wild turkey to be the national bird, because he thought the eagle was of bad moral character as it was a scavenger. 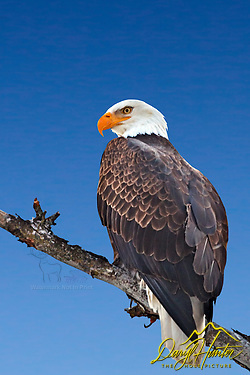 The Bald Eagle has since become the living symbol of the U.S.A.’s freedoms, spirit and pursuit of excellence. Its image and symbolism have played a significant role in American art, folklore, music, and architecture. They are very large birds, they stand about 30-45 inches tall, their wing span may reach up to 7 feet depending on the individual adults over 5 years old have a white head, neck, and tail, dark brown to black body and yellow bill. Immature eagles are brown with whitish wing linings and blotches on bellies. Their head and tail will whiten with each molt as they reach maturity. The bald eagle is a member of the sea and fish eagle group. They live near large bodies of open water such as lakes, marshes, seacoasts and rivers, where there are plenty of fish to eat and tall trees for nesting and roosting. The Greater Yellowstone System is full of prime eagle habitat. Bald eagles can spot fish in the water from several hundred feet above, while soaring, gliding, or in flapping flight; hence, the cliché “Eagle Eye.” You can often see them gliding in circles above the water then abruptly hovering while getting a fix on a fish before the dive. 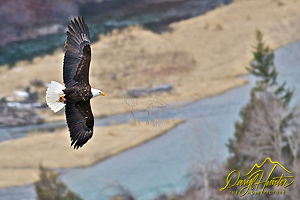 Once an eagle spots a fish near the surface of the water, it dives and snatches it out of the water with its talons. A bald eagle’s lifting power is about 4 pounds. This is quite an extraordinary feat, since most fish are counter-shaded, meaning they are darker on top and thus harder to see from above. Bald eagles also steal food from other bald eagles and ospreys. Ospreys are much better fishermen, but their smaller size prevents them from defending their catch from the larger eagles. An eagle merely chasing an Osprey is usually enough to persuade it to drop its fish at witch time the eagle will swoop on the fish and catch it in mid air, but occasionally bald eagles will attack them. Bald Eagles use a specific territory for nesting, winter-feeding or a year-round residence. Nesting usually begins in late February to mid-March. Eagle chicks hatch from the large nests, usually perched over lakes, or rivers, in late March-early April, while fledglings leave the nest somewhere between late June and late July depending on the elevation of the nest. When nesting, eagles lay two to three eggs sometime after February to mid-April. Both adults incubate the eggs, which hatch five weeks later. At birth, eaglets are immobile, downy, have their eyes open, and are completely dependent upon their parents for food. When 10–14 weeks old, they fledge and fly from the nest. As winter approaches, immature and sub-adult eagles typically leave the park. Winter habitat for those Bald Eagles that stay often centers on elk and bison winter ranges and watercourses free from ice. Carrion and waterfowl are the primary food items taken by Bald Eagles in the winter. Fish can be taken as a winter food item but are not as easily available as in the summer because of the icing of lakes and rivers. Fish also stay in deeper water in winter. Today there is only a small fraction of eagles that there were when Ben Franklin tried to make the Turkey our national bird. There is no single cause for the decline in the bald eagle. When Europeans first arrived on this continent, bald eagles were common. As the human population expanded westward, the natural habitat of the eagles was compromised, leaving them fewer places to nest and hunt, which caused the population of bald eagles to decline sharply by the late 1800s. By the 1930s, people became aware of the diminishing bald eagle population, and in 1940 the Bald Eagle Act was passed. This reduced the harassment by humans, and eagle populations began to recover. Unfortunately for the eagle DDT and other pesticides began to be widely used. Pesticides sprayed on plants were eaten by small animals, which were later consumed by birds of prey. The DDT poison harmed both the adult birds and the eggs that they laid. The eggshells became too thin to withstand the incubation period, and were often crushed. Eggs that were not crushed during incubation often did not hatch, because of high levels of DDT. DDT was banned and eagle population began their slow recover. A Bald Eagle management plan objective for the greater Yellowstone ecosystem is to have 62 breeding pairs produce an average of 53 young each year. 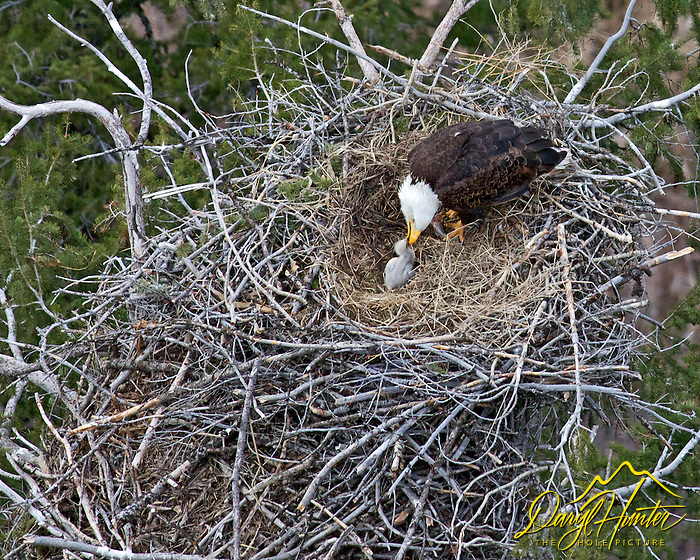 The population count in 2007 resulted in a count of 34 eagle nests that produced 26 eaglets. I see Bald Eagles nearly everyday while leading my National Park tours, wildlife safaris and photography tours and I never fail to be awe struck when seeing Eagles soar through the air above or proudly perch while surveying their territory below. Posted on Saturday, March 17th, 2012 at 11:16 am. Filed under: Wildlife Tags: bald eagle, bald eagle nest, endangered species, Greater Yellowstone, raptor, recover, snake river, threatened species	RSS 2.0 feed.